President Edgar Lungu says some people opposed to his efforts to unify the party on the Copperbelt are now barking like wild rabid dogs, in apparent reference to Roan MP Chishimba Kambwili. This week, Mr Kambwili urged President Lungu to fire Copperbelt Minister Bowman Lusambo accusing him of being behind the confusion in the PF in the province. But President Lungu said some people were hoping that he could fire Mr. Lusambo so that they could take over. 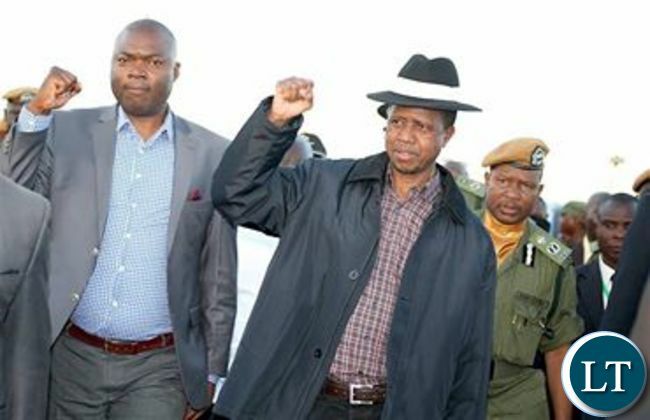 Addressing PF supporters at Simon Mwansa Kapwepwe upon arrival in Ndola to officiate at this year’s Zambia International Trade Fair, President Lungu said those who are unhappy that he went to resolve the infighting in the PF on the Copperbelt are now ranting like wild rabid dogs. “Let me emphasize that when you are divided, your enemies are very happy. When there is bickering in the family, you discover that your enemies enjoy and celebrate. When they see you uniting, they get sick. Those who are not happy as a result of the effort that we made of trying to dialogue are busy ranting like wild rabid dogs; you can tell and we can see them and you can know them,” President Lungu said. President Lungu admitted that running a country was a difficult task. Earlier, Mr. Lusambo informed President Lungu that he would soon start exposing those behind the confusion in the province. “As Provincial Minister, I want to thank you for sitting us down and I want to salute you for that. I can assure you that this province will never be the same. We know the people who were behind those issues which you came to address and very soon, we will be exposing those people to the people of Zambia, the people who want to sabotage your efforts which you are giving to this country through development and uplifting the lives of our people,” said Mr. Lusambo. 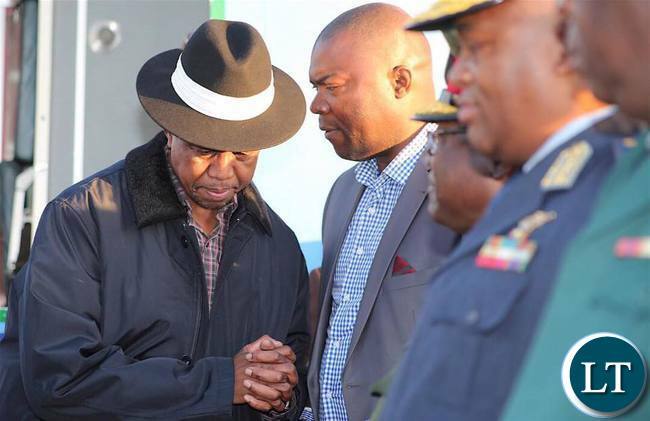 Why is lusambo making a PF gesture. I thought he was MMD. Why not make the MMD symbol ? Battle lines have been drawn. Can’t wait to hear what Kambwili has to say. Both dogs will be tearing each other apart! As soon as HH is out of Mukobeko he will be making an FDD gesture that’s how these politicians are out of touch and they do not know what they are doing. Dora and RB have disappeared because they don’t even know where they belong. RB might be UNIP, MMD or PF. We are fed up with the hearing of internal PF squabbles. So this re-affirms my assertion (and others on this forum) earlier in the week that ECL is out there issuing proclamations to scare off his opponents within PF. To today No ACTION, just continuing with proclamations. He is the President and has all the channels to act, and talk less, why not talk directly to the so-called “dogs’?. Thank GOD, the “barking like wild rabid dogs” he is referring to are in PF, I almost thought he was referring to bloggers here. So he is leader of dogs, party of imbwa shakalyelye, especially one female one. You can fool some people now! but your legacy will judge you. A leader should always use language that evokes decency! This is a poor selection of words! It is unpresidential! I, too, have a serious problem with the way this President speaks. He uses very provocative language that adds fuel to a already burning situation. He never calms the situation down, always inflaming. The hallmark of leadership is civility. Let me mention that when things are going well with you , people will know your name but when you are pushed in the corner, they will know your character which is the real YOU. Some one said the real YOU is what comes out of YOU when you are annoyed. As a proud Zambian, I am really taken aback by the choice of your words Mr President. I tell people that despite how annoyed you are, there are certain words you should not use and “DOG” is one of them because God made us in his own image, so it is always important to tame your tongue than to be controlled by it. Next time Mr President Iam sorry to say you should mind your language. This language is something else. I don’t know…!!!! Eye contact ba President not on the ground. How will you know if he’s telling the truth if you are not looking at him? It’s common inmost Zambian men, they usually avoid eye contact each time they are engaging with someone. Why? Is it a sign of respect or? This is his normal terrain not what public media have been feeding you on baliba hubble. NEZ was caught spraying venom in the government complex, soon he will join HH in the gallows. Oh, so he is president? What happened to the petition? Lusambo a typical blue-eyed boy licking his master’s boots. In Lungu’s administration one has to lower himself to nothing to earn a living. …hhmmm…the last time someone reminded hh the upnd needed a convention, he found himself out of the party. No one ever dares question “his lordship” hakainde lest you find yourself being hounded….sounds familiar??? Even if you are CEO of a large corporation, you still have to put your house in order and instill discipline. Well said, Mr. President. Flush out negative elements like Kambwili and Musenge. Let the young man Lusambo continue his hard work unhindered. Please Mr. President tone down, this is what Kambwili wants for you to error, forget about him he is a nobody without PF. more over we have visitors. LEAVE KAMBWILI AND MUSENGE ALONE.THESE PEOPLE THAT ARE BEING HERO WORSHIPED TODAY BY LUNGU LIKE BOWMAN LUSAMBO AT ONE TIME ALMOST ROUGHED UP THE LATE MCS.MHSRIP.TODAY LUSAMBO CAN NOT BE MORE PF THAN KAMBWILI AND DORA AND THIS IS WHAT IS ANNOYING SOME OF US PEOPLE IN PF.WE HAVE NOT FORGOTTEN HOW DORA USED TO INSULT SATA LEFT,RIGHT AND CENTER AND ONE TIME SHE WAS SAYING SATA PUTS ON BOMBASA. I REALLY REGRET TO VOTE FOR LUNGU AND I DON’T THINK THIS MAN WILL SEE MY VOTE AGAIN.HIS LANGUAGE IS MORE LIKE A KAPONYA.HE SHOULD NOT THINK THAT HE IS UNIFYING THE PARTY BY INSULTING SOME MEMBERS IN PF. Just admit the boat is sinking and with it all PF minions. Nervous Mumba for UPND president! The President sounds really fed up with donkeys! Regarding the UPNDonkey party, so no convention and no democracy? But as donkeys they can demand democracy at national level. Yes of course as Donkeys. Sorry EL, you are just describing yourself. It’s you who is barking like a wild rabid dog, especially lately! Kuya bebele PF your time is over CK join another party there is no room for you as of now in the PF. The president has a very nasty way of resolving issue. Leave him PF is finished in as far as politics are concerned. This is all Lazy Lungu knows…Presidency is too big for him!! OH, so in PF there was people who rant like wild dogs. May the President names them? Are they going to be charged of treason? Which enemies has the President have? Which of his enemies are happy if he fails to discipline his juniors? His juniors are able to hack his enemies because The President does not love his enemies. Our President is full of hatred , malice ,caprice, hypocrisy and anger with his perceived enemy. Sad to listen to such statement coming from the Head of State. If some are barking like wild rabid dogs, what are others doing? Others would be bleating like the timid sheep. What is the President doing if some are barking? Do some people bark? I thought people talk for everyone to hear the words spoken. Mr President if there are internal issues bothering your soul , I urge you not to let them out on Zambians. I personally, do not want to part of your internal soul problems. Never govern with your feelings and subject the Zambians with those feelings. Every Zambians has personal problems and are not looking up to you for solutions. Zambians can live without you because you are just a mortal being like everyone. You don’t own us and your language must be considerate. Zambia is owned by Zambians. Even if you live or die now, our life will continue. Sata died and Zambia continues. I would rather fear GOD than you, Mr President because you have no capacity to kill my soul. I obey you to a certain limit but I shall never worship you no matter what. You can be powerful not but your power is transient. You can do what you want but everything has its time. This is your time but consider your ways. Greater men lived before and are no more . Wise men lived before and are no more. Where is King David? My plea to you Mr President , be sober and repent . Take the word of GOD seriously and refrain from evil. @robmwale:SO NOW YOU ADMIT THAT H.E.EDGAR LUNGU IS YOUR PRESIDENT TOO?WHAT ABOUT YOUR PETITION,IT HAS DIED A NATURAL DEATH?hehehehehe!! Language Language Language, my foot! I have never seen a wild rabid dog. What does it look like? OH I see! I did not put two and two together. So its Kambwiliiiii! Njimbu. I don’t support HH or UPND. I am a free Zambian free from political connection. I will never support PF and ECL. I don’t trust politicians because their greediness. Chishimba K. you should learn from your friends kilometer sampa, mulenga sata, muzungu opusa, etc. where are they to day? kilometer formed his own party where is it? immediately you form your own party that will be the end of you even the closest person will stop greeting you. Try it so that you can prove me wrong. Welcome, welcome, welo kamu Robmwale, for being baptized now you have started seeing than looking without seeing. It is actually the impostor himself and his disciples, Kampyongo, Kaizer, Mumbi etc who have all along been ranting like wild rabid dogs. Have I not referred to them as as such for a long time now? Why are they quick to borrow my words? Do they not have their own words? This is my own President. Did you see him? Edgar Chagwa Lungu. Abesu! You love it or not. UPND wawa again come 2021! You preside over dogs! Hmmm! And those dogs voted for you! I advise you and Chief Mukuni to refer a human being to a dog no matter what. Please choose wise people to advise you because the people around you are just helping you to lose even that you have. What can you get from Kaizer Zulu? And Bowman Lusambo is a minister of the Copperbelt belt? I am just wondering? Maturity matters. Sober up! You and Chief Mukuni not to refer a human being to a dog! Typo! Bakateka besu nabo language nishani. Can u unite the party instead of tearing the party apart.We still love you but Kambwili muntu wesu.Lusambo in Kopala teti akontolole.He has failed. Its important to always be civil no matter what. If you call others rabid dogs why shouldn’t they call you the same. But brainless cadres will defend anything just because its their leader. If Edgar Lungu can’t even unite his own PF party and cool the embers then how can he be a uniting symbol for the nation?